Today, I am going to post about Barli Asmara's show during last Bazaar Fashion Festival. As I got the blogger pass, I can watch any fashion show during the event. I came late to Barli Asmara's show because I was rushing from the previous fashion show to the other one all the time. Therefore, apologies for the bad angled pictures as I got the back side corner for me to take pictures since all the good spots were already taken by other medias. 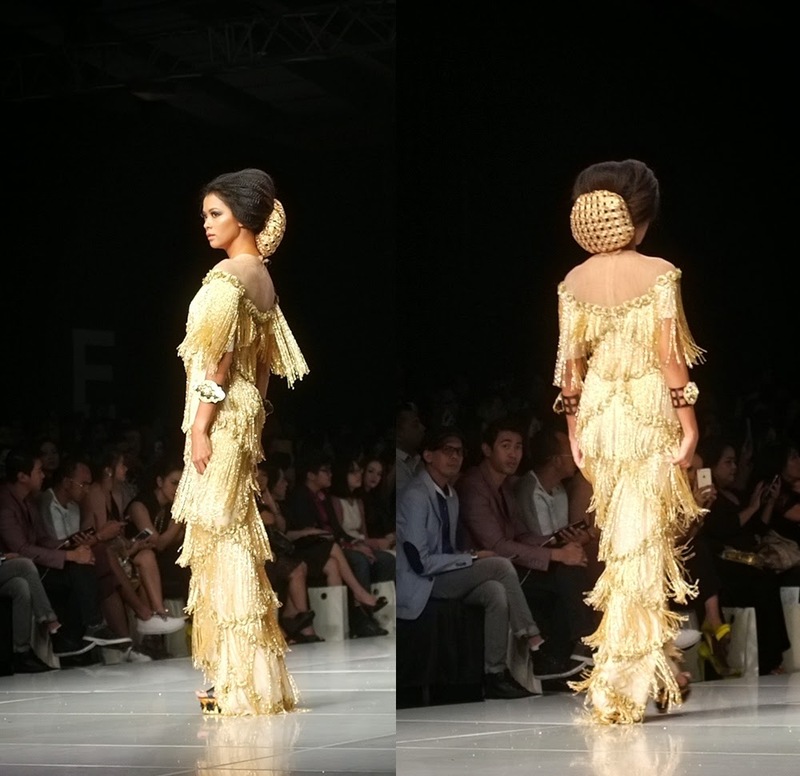 Okay, continuing about the show, Barli Asmara expressed his admiration towards Javanese culture in this collection. The show was opened by Andien's magnificent perfomance *I clapped loudly after her performance* and continued immediately with the fashion show. At first glance, it kinda reminded me of Alexander McQueen's 2013 Spring/Summer collection which is inspired by bees but both are definitely different. Inspired by Queen Keraton's silhouette that is transformed into night dress with batik nuance, the collection is dominated with gold, black, and copper. Fabric with truntum pattern were purposely re-designed with digital print technique on top of taffeta fabric to strengthen the traditional impression. The high tradition was successfully interpreted to the whole collection with varieties of ornaments that emit wealth, luxury, and classic Javanese culture. Further more, the collection is completed with accessories that are made from acrylic and varieties of gemstones, making it a fully luxurious series of work.